HUDSON VALLEY, N.Y. — I work for Radio Engineering Services, a New York-based company. We maintain, design and build systems and studios for a range of clients including Cumulus Media, Townsquare Media and others. One of our jobs is helping clients find the appropriate equipment for their needs and integrate that new technology into their systems. A station we work with, WDST(FM)/Radio Woodstock, recently switched their studio to VoIP. They had a traditional phone system, which doesn’t really work with VoIP, so they needed to make a change. The multiple-line VoIP hybrid systems they were familiar with costs upward of $6,000, and they weren’t ready to spend that much money.While looking for a better solution, I learned about VH2, a two-line VoIP hybrid from Comrex. I asked my client if they’d be able to work with just two lines — this turned out to be better for their purposes. Installation was straightforward. I connected the VH2 to a standard network, and was able to log into it through Device Manager (a straightforward browser-based program, used to configure settings and monitor connections). The directions and the layout are intuitive, so it was easy to set up. The details of the SIP network took a little longer to put together, but after that was taken care of, tying the VH2 into the audio console and setting up the phone took less than an hour. Since we installed the VH2, it’s been perfect for their needs. They’ve found it to be quiet and easy to use — not to mention cost-effective. To teach the studio staff how to use the VH2, I went over it twice with a couple of people, then printed a three-paragraph section out of the manual, laminated it and stuck it on the wall by the box. As of now, I have not heard a peep out of anybody, they understood it right away. The person who uses it on a regular basis is not a professional jock or a radio person. For her to just settle in and get it to work to the point where she doesn’t want to rip it out of the wall and throw it down the street — that’s saying quite a bit. I’ve already recommended it to more people. 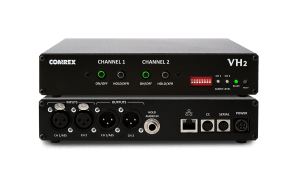 For my clients who need a hybrid that sounds good, is easy to install and isn’t going to break the bank, VH2 is perfect. Call quality is great, it’s stable, it plays nice with networks, installation is easy and it’s priced such that many people can afford it. It’s a solid product, and it’s on my short list for people who are looking for VoIP hybrids. This story was originally published in Radio World. To read the original, click here. Discover what VH2 can do for you. Click here to learn more.